Our commercial move is backed with a complimentary crate hire, business relocation advice and an experienced commercial supervisor for all types of relocation. 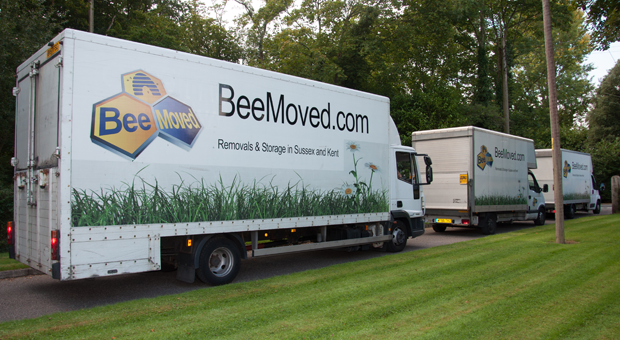 In the past Bee Moved have supplied moves for the likes of The National Trust (Scotney Castle), Riochet Film Company, Madgex Recruitment and extensive archiving for the NHS Brighton and Hove Trust and Newhaven Enterprise. We also provide secure storage and archiving facilities to help you with any short or long-term storage needs. For further information on storage and archiving please see www.beestored.com. Bubble bags for flat screen monitor protection. Once you confirm to use Bee Moved's relocation services, we will deliver all these items to your doorstep. Do not forget to empty your desk drawers. Each employee should be allocated a crate for personal items in their desk. Label desks and chairs with the employees name so at the other end they can be paired up. All furnitures on your relocation where required will be disassembled and reassembled by Bee Moved. Remove old and outdated files from your computer and generate a back-up. The back-up of data should be stored at a convenient and safe location off site. Again if required label any mice or screens for employees to help the relocation team group them together in the same crates. At Bee Moved all screens will be bubble bagged before being placed into monitor crates another part of are inclusive service. All servers are double wrapped and placed in roll on roll off cages for transportation. Before initiating the packing process, ask your employees to take all personal items home from their desk or in the office premises. They should be responsible for their own laptops. Make a point to do a good clean out, this is an opportunity to rid your office space of unwanted items. Make sure to complete your packing a day prior to the actual relocation. Use cardboard boxes and bubble wraps to pack your stuff safely. We suggest that all employees in the office sort through their filing to discard anything that maybe obsolete or out of date. Again it is advisable that all telephones are labelled to each desk. It is always advisable to keep all the IT kit for a workstation together in the same crate when packing. Once staff have packed their own areas encourage them to help pack away the communal areas as this will take the workload off yourself or again Bee Moved can provide a quote for this, ask at survey. Safes and fireproof cabinets can sometimes require specialist moving, at Bee Moved we can deal with this on the move day providing it has been pointed out at the survey. All liquids and ink and toner cartridges should be removed and paper trays emptied. Follow the manufacturers instructions in preparing for a move. Indeed, your leasing company should be informed of your move if any of your printers and photocopiers are leased and not owned outright and then they can make arrangements to move the items themselves.